Jack Taylor’s Alexandria Toyota proudly uses Genuine Toyota Synthetic Motor Oil! To maintain the quality of your Toyota, use motor oil formulated specifically for your vehicle – Genuine Toyota Motor Oil. Genuine Toyota Motor Oil is a unique combination of lube base stocks and a special additive package that promotes optimum engine performance. Today’s sophisticated engine systems require a lubricant designed specifically for improved engine performance, increased fuel efficiency and reduced engine deposits. Many new Toyota models are certified for a new zero weight synthetic lubrication standard (SAE OW-20). Our OW-20 oil is a low-viscosity synthetic oil formulated to proved uniform lubrication and reduce friction throughout the engine. Lighter than conventional engine oil, OW-20evenly and uniformly bathes your engine’s moving parts, which means less wear and tear, better thermal stability and increase engine efficiency. By increasing the efficiency of your engine’s oil flow and reducing friction, genuine Toyota OW-20 oil delivers a surprising boost in fuel efficiency, from 0.4 to 0.6 miles per gallon when compared to conventional or non-synthetic oils. Low-viscosity lubrication also brings improved engine performance through a wide range of temperatures. Especially in cold weather, a quicker oil flow to critical parts will result in faster starts and better overall engine protection. The superior qualities of synthetic oil have allowed the oil change interval to be extended form 5,000 mile to 10,000 miles for most models. However, you should continue to check the oil level regularly and top-off if needed. That will help your engine get the full benefit of the new oil. 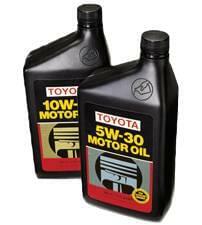 Genuine Toyota OW-20 synthetic motor oil helps provide lower cost of ownership through extended oil change intervals. Oil changes should also be based on driving habits and conditions. Although your new Toyota may not require oil changes as frequently, the “Maintenance Required” indicator light will continue to illuminate every 5,000 miles as an important reminder of the need to have other maintenance performed on your vehicle. Regular inspection and tire rotation helps ensure you vehicle’s continued performance and safety. Can I Use Any Brand of OW-20 Synthetic Oil? Genuine Toyota Motor Oil OW-20 includes a Toyota-specific additive package that will provide the best results for oil performance and fuel economy – it’s what the engine was designed to use. However, other OW-20 synthetic oils can be used, even though they aren’t optimized for Toyota engines. Genuine Toyota OW-20 synthetic motor oil meets and surpasses all new Toyota model specifications, and is certified by the American Petroleum Institute (API). Older Toyota models may require either conventional or synthetic motor oil. While the up-front cost will likely be $20-30 higher, synthetic oil can help save money in the long run. A vehicle designed to operate using OW-20 synthetic oil typically has fuel economy ratings about a half-mile per gallon higher than a similar vehicle using mineral oil. Assuming 20 mpg as the base $2.50/gal for gas, this could save $30 every 10,000 miles on most models, which is the distance between oil changes. So, fuel savings alone can help repay the added cost of the oil. Includes: Change oil (up to 5 qts. ), install Genuine Toyota oil filter, inspect & adjust all fluid levels and complimentary multi-point inspection with print out.